There are few places as glitzy as Las Vegas, and few trade shows bigger than CES. 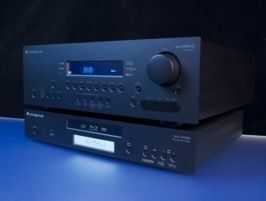 So it's no surprise that British AV specialist Cambridge Audio opted for to use the expo to officially launch its debut Blu-ray player. First previewed at CEDIA 2008, the Azur 640BD is scheduled to hit retail in the coming months and will be priced at around $1,000 when it launches in America (excluding sales tax - UK prices are currently unconfirmed). The Profile 2.0 compatible deck features full HDMI 1.3 output (including hi-rez audio bitstreaming), internal decoding for Dolby Digital EX, DTS ES, Dolby Digital Plus, Dolby True HD and DTS HR surround sound formats, 1080p24 Blu-ray playback and 1080p upscaling for good old DVDs. The player also offers a front-mounted USB socket enabling access to external content from portable drives, and provides a full set of analogue video outputs, Ethernet, SPDIF, Toslink and separate dedicated 7.1- and stereo analogue audio outputs. The Azur 640BD will be available in a choice of silver and black finishes. To complement the Blu-ray player, Cambridge Audio also has a new version of its acclaimed Azur 640R AV receiver that has been developed to act as the perfect partner for the 640BD. The Azur 640R V2 is expected to retail for around $1,800 when it hits stores Stateside (excluding sales tax, and once again there's no UK price yet) this Spring. The flagship 7.1-channel receiver features three HDMI 1.3b inputs and employs the latest Cirrus CS49700 chipset with twin 32-bit DSPs to ensure compatibility with Dolby Digital Plus, DTS-HD HR, Dolby TrueHD and DTS-HD MA formats. It also provides full support for analogue and digital legacy formats including LPCM, Dolby Digital, Dolby Digital EX, DTS, DTS ES Matrix and Discrete, DTS 96/24, DTS Neo:6, ProLogic II and ProLogic IIx in 5.1, 6.1 and 7.1 variants. Post processing of 2.0, 5.1 or 6.1 digital material is also possible with PLIIx or DTS Neo:6 to turn these formats into full 7.1. The company promises 7 x 100W power output at 8 ohms with all channels driven. Other features include adjustable LipSync delay, Cambridge Audio Mic Controlled Auto Set-Up (CAMCAS), optional bi-amping mode for front left/right with surround back left/right in 5.1 setup and proprietary X-Tract Forced/Convection Heat Tunnel design that enables the 640R V2 to operate extremely quietly and at a low temperature.